Want to serve guests of your restaurant, cafeteria, or diner the taste of homemade, time-honored comfort food without all of the kitchen prep work? 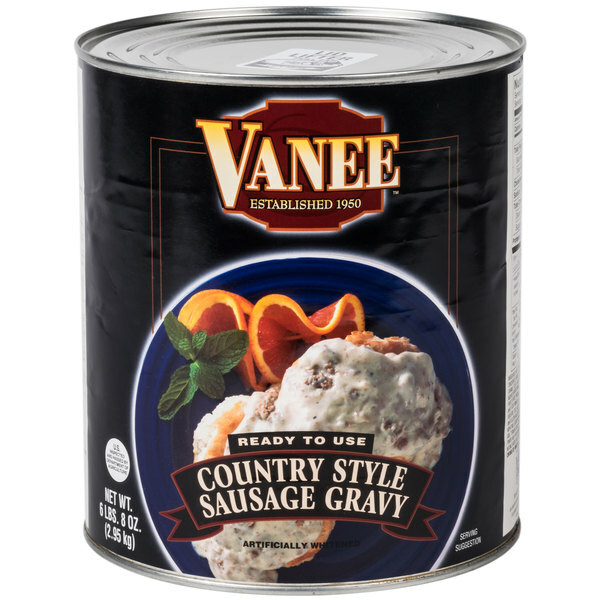 Vanee 590PX country style canned sausage gravy offers this desirable home-cooked flavor and appearance that your customers are sure to love! Made with cooked pork sausage, this irresistible sausage gravy is ready to heat and serve. Family owned and operated since 1950, Vanee offers deliciously-consistent and convenient products at a great value. Whether craving traditional country-style favorites or preparing gourmet creations, this sausage gravy is a quality product to serve your culinary needs. Its smooth, creamy consistency and savory taste enhances the tenderness and flavor of popular entrees. Pour this rich gravy over meats, ham, or poultry, and serve with mashed potatoes and stuffing. Serve with warm, flaky biscuits for a country-style breakfast, or use it as an ingredient to create signature sauces for pasta noodles. Whichever way it is prepared, this gravy will help you create dishes that will keep your customers coming back for more! This gravy is nice and thick with plenty of sausage bits. Not spicy so people who don't like spicy sausage can enjoy this. Makes for an easy fast hot breakfast. I love white, country style gravy. I mean i really love it! I look forward to weekends when my breakfast is fresh biscuits with country style gravy. In the bask i have always made the gravy from a packet. Well I bought a can of this Vanee grave to try. Wow, it is amazing. It tastes just like a great breakfast from my local diner. If you like white gravy like I do give this product a try. By the way, I also love this product on pancakes! Try some yourself and see what you think. Oh wow this was great! I loved the easy open and heat. Another great item you can freeze the leftovers. Lots of sausage with the gravy. Just the way I like it. For sure buying again. 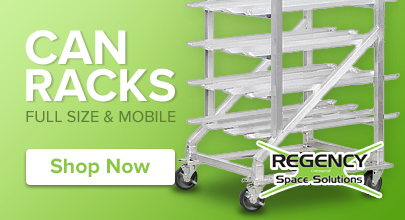 A must for any breakfast buffet or catering event. We cater a lot of breakfast events and this sausage gravy is always a hit. Easy to prepare and tastes great. 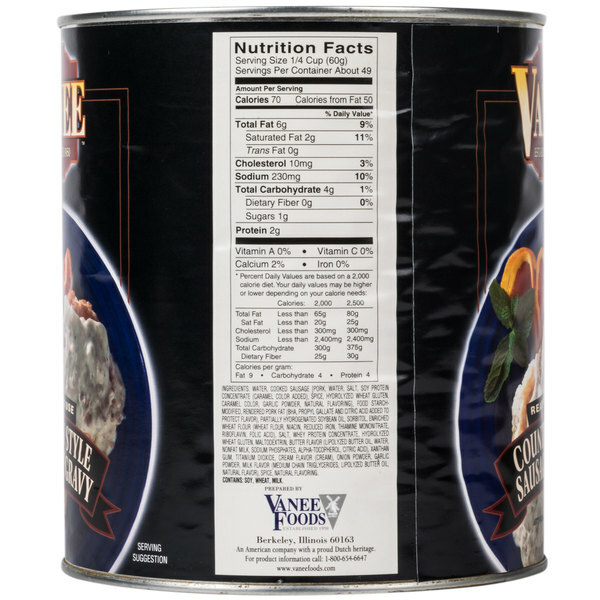 This gravy was ok, we used it in our coffee shop for quick orders of biscuits and gravy, with some added salt and pepper it is just ok.
A great value and very delicious can of country style sausage gravy. The perfect addition to any breakfast menu. It makes a great smothered hash brown. The Vanee Country Style Sausage Gravy definitely exceeded my expectations. The quality is great. The price is reasonable. I would highly recommend. 5 Stars! I will definitely purchase again. Way better than what is available at our local store! This is easy when you've slept late but promised to have country gravy for the breakfast table. This one does have a good flavor. You can thin it to the consistency you desire. 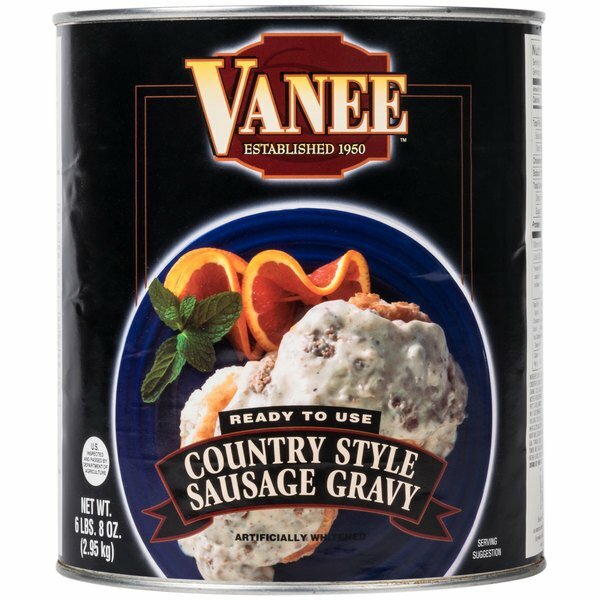 Vanee sausage gravy is rich and thick. Wonderful topping for our fresh made biscuit . It has lots of sausage bits and our costumers love it. That can is huge ! Good price, quick shipping, and good packaging. Great taste, easy to open can. No issues ordering online. Will buy again. We do a monthly church brunch for about 30 to 40 people. The cost is absorbed by donations sometimes we don't break even . Most of the big box store canned gravy is sparse and watery. This is thick and creamy and not cost prohibited. Menu Scramble Eggs potatoes biscuits gravy toast hash waffles Fried chicken . chili dogs and chili. This country style sausage gravy tastes great, it comes in big #10 cans and serves alot of people, the price cant be beaten, will buy again! A great homemade tasting Country Sausage gravy. Tastes great and is easy to prepare. A great value as well this can is big and serves a lot of people. This gravy is awesome ! Taste like homemade without all the mess and clean up after. Great to keep in crockpot and doesn't get watery. I got this item because we enjoy Sausage for a supper meal I like a spicy sausage and this is for a person who wants it bland. Nothing wrong with that but I prefer spicy. Very tasty country style sausage gravy. Tastes like homemade but so much simpler to make. Freezes well also so I can make this can last awhile.